In this tutorial we are going to look at how to build applications with Angular 2 as well as how to add token based authentication to Angular 2 apps the right way. Angular 2.0 has finally been released. In this tutorial we are going to look at how to build applications with Angular 2 as well as how to add token based authentication to Angular 2 apps the right way. Check out the completed code example from our GitHub repo. Angular 2 finally hit the major 2.0 release milestone just a few weeks ago. The final release of Angular 2 did not have many breaking changes. The Release Candidate 5 (RC5) release, made available just a few weeks prior to final, introduced major breaking changes and additions such as the @NgModule decorator, Ahead-of-Time (AOT) compiler and more. In today's tutorial, we are going to utilize some of these new features to build an entire Angular 2 application. Components, @NgModule, route guards, services, and more are just some of the topics we'll touch on. Finally, we'll implement token based authentication with Auth0. Angular 1.x was highly regarded as a robust framework for building single page applications (SPAs). It did a lot of things well, fell short on some, but overall allowed developers to quickly build powerful applications. While Angular 1.x is a framework, Angular 2 is an entire platform for building modern applications. Alongside the core Angular 2 library, the platform ships with a powerful Command Line Interface (CLI) called Angular CLI that allows developers to easily scaffold their applications as well as control the build system. Angular Universal brings server-side rendering to Angular 2 applications.Angular Material 2 is the official implementation of Google Material Design which allows developers to build beautiful applications with ease. Angular 2.0 has officially shipped, but the other components of the platform are still in alpha and beta stages. For our application today, we will make use of the Angular CLI and the core Angular 2 framework, but we'll let the other components bake a little longer. "While Angular 1 is a framework, Angular 2 is an entire platform for building modern applications"
The app we are building today is called Daily Deals. The Daily Deals app displays a list of deals and discounts on various products. We'll have a list of publicly available deals that anyone can see and a list of private deals available only to registered members. The private deals are exclusive to registered members, and should hopefully be better. When you are happy with the public and private deals, launch the server by running node server and navigate to bothlocalhost:3001/api/deals/public and localhost:3001/api/deals/privateto make sure you can see the list of deals you added. Next, let's set up our Angular 2 front-end. One of the best ways to start building a new Angular 2 app is with the official Angular 2 CLI. The CLI can take care of scaffolding the initial app, adding additional components, takes care of the build system and much more. In this tutorial we will scaffold our initial app with the CLI. If you don't already have it installed, run npm install angular-cli -g to install the Angular CLI. We'll interact with the CLI using the ng command. To create a new application, choose a directory and run ng init. This will create a new Angular 2 application in selected directory, download all of the required NPM packages, and basically set everything up for us. Let's head over the localhost:4200 for now to make sure that everything is working as expected so far. If you see a message saying "app works!" you are golden. Next, let's examine how our Angular 2 app is scaffolded. The ng init command scaffolded our Angular 2 app and added a lot of files. Many of these we can ignore for now like the e2e folder, which would contain our end to end tests. Open up the src directory. In the src directory, we can see some familiar files like index.html, styles.css, and so on. Open up theapp directory. Delete app.component.css, app.component.html andapp.component.spec files. We'll define all we need for our root component in the app.component.ts file. Create a public-deals.component.ts, public-deals.component.html, andpublic-deals.component.css file. This component will take care of getting and displaying the public deals data. Create a private-deals.component.ts, private-deals.component.html, and private-deals.component.css file. This component will take care of getting and displaying the private deals data. Create a deal.ts file. This component will hold our deal class which will let Angular 2 know the structure of a deal. Create a deal.service.ts file. Here we'll add the functionality to get and retrieve the deal data from our API. Finally, create an app.routing.ts file which will take care of our routes. Every Angular 2 application must have a root component. We can name it whatever we want, but the important thing is that we have one. In our application, the app.component.ts file will be our root component. Let's take a look at our implementation of this component. We've created our root component. We added an inline template and some inline styles. We haven't added all the functionality yet, so every user will be able to see all the links and the login and logout buttons. We'll wait to implement those a little bit. To use this component, open the index.html file in your directory and replace<my-app></my-app> with <daily-deals></daily-deals>. We left the class name AppComponent so we don't need to make any edits to our app.module.tsfile. We can just navigate to localhost:4200 and see our app displayed. We won't see much yet, just the top navbar. TypeScript allows us to define the structure or type of our objects. This serves a bunch of useful purposes. For one, if we define the structure of an object, we'll be able to get all of the object's data via IntelliSense. We can additionally test our components easier by knowing the data structure or type of object we are dealing with. For our app, we'll create one such type. In the deal.ts file, we'll define a type of Deal. Let's see how we'll accomplish this. Now we can declare objects in our Angular 2 application to be a type of deal. These objects will gain all of the properties and methods of the deal type. We are only defining properties here, we won't have any methods. The public and private deals components are very similar. In fact, the only difference between the two implementations is that one will display deals from the public API and the other will display deals from the private API. For posterity, we'll just show one of the component implementations. Let's implement the public-deals.component.ts. // Note: We haven't implemented the Deal or Auth Services yet. // When this component is loaded, we'll call the dealService and get our public deals. Next, let's build the view of our public deals component. We'll do this in thepublic-deals.component.html file. Our view will be a mixture of HTML and Angular 2 sugar. Let's take a look at our implementation. This will ensure that each of the products displays nicely on our page. Our private deals component will look very similar. For posterity, we won't display the scaffold. We'll cover the changes a little later on. If you'd like to see what it looks like, you can view it from our GitHub repo. Now you can see where the getPublicDeals() method fits in from our public-deals.component.ts file. We also have written a getPrivateDeals() method that will get our list of private deals. Implement this method in your private-deals.component.ts file. Now that we have our two components created, let's implement routing so that we can display the appropriate component. Routing in Angular 2 has changed a couple of different times. The new new new router is really great though and supports many features developers have been asking for such as lazy loading. For our application, we will create two routes. The /deals route will display the publically available deals, and the /special route will display the exclusive private deals that only registered users will have access to. 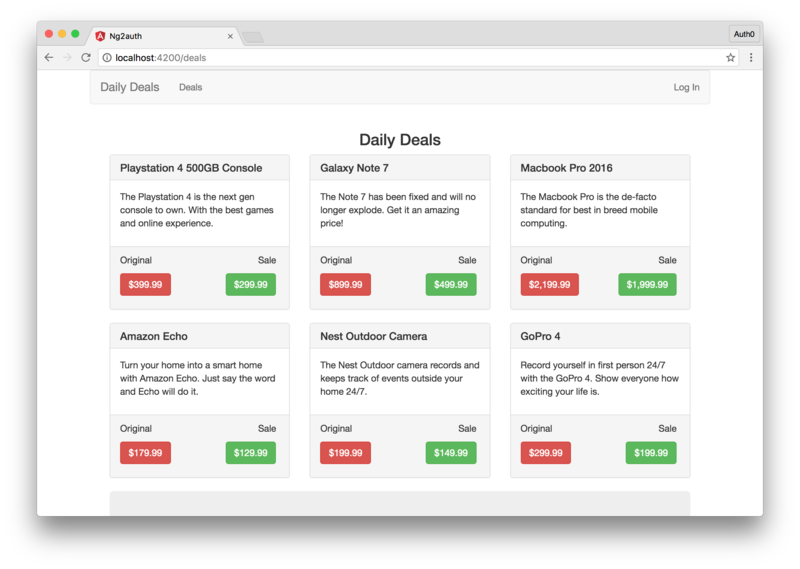 We'll also add a redirect, so that when the user lands on the homepage, we'll automatically redirect them to the deals page. Let's see how we are going to implement this. Our routing is looking good. Our entire application should be ready to test now. Before we test our application, there is one final thing we need to do to ensure that everything works correctly. Note: If you decide to test your application before the conclusion of the tutorial, you will need to remove the AuthService from your deals components, otherwise Angular will complain. Now we are ready to test our app. If you would like more information on how @NgModule works, check out this post. Navigate to localhost:4200 and you should see be redirected to the deals page automatically. Notice that you can freely navigate to the /secret route and see the exclusive deals as well. You can do this because we haven't added user authentication yet. Let's do that next. Stay tuned for Part II, coming soon!